in Marlene-Dietrich-Platz in Berlin. Sadly the band has resisted appeals to have Stan Jones on the grounds that consuming home-made colloidal silver in an inappropriate path to achieve blueness. The venue itself was perfectly acceptable for a sit-down audience and sharply inclined to provide all audience members a complete view of the stage area. 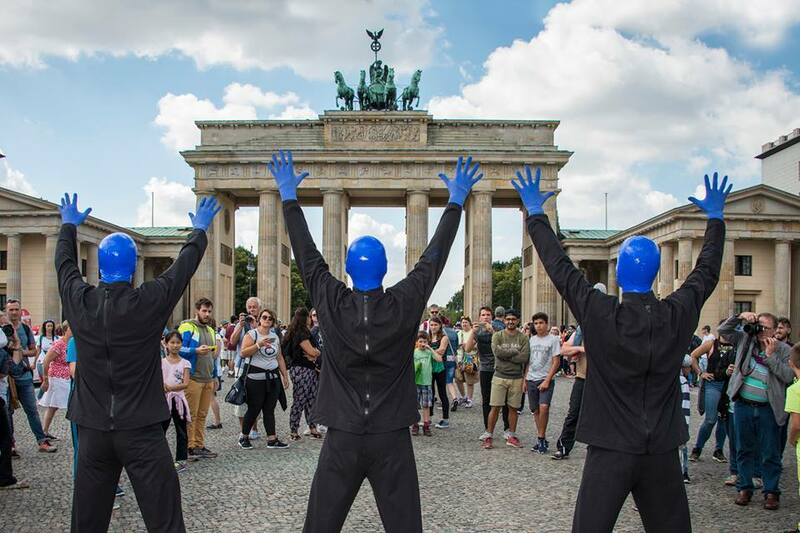 A cute touch was the inclusion of three blue Berlin bears (“Buddy-Bären-Denkmal”) outside the concert venue. The BMG themselves in this particular incarnation are Martin Marion, Kuba Piezchalksia, and Stefan Ruh, supported by the band of Jan Burkamp, Tim Neuhaus, and Nils Westermann. Now, this is raised because the BMG, at least the people at the front, aren’t really a band in the traditional sense. 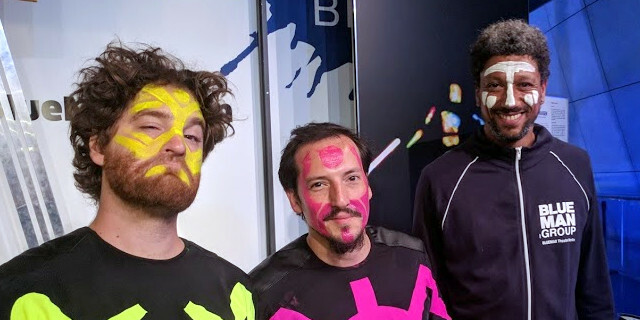 Aside from percussion, they are mime performance artists, and the musical accompaniment is provided by the latter who are deserving of at least some recognition as well. 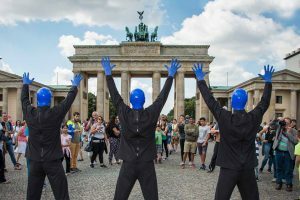 Credit is also given to impressive organisation of this performance troupe – the BMG is billed twice a day, have performed over a staggering five thousand shows in Berlin and, to bring some immediate relevance to this review – are still going. This said a show that has such a long run obviously will include a great deal of material that has been previously performed, and BMG is no different in that regard. Significant amounts of their material come from previous albums, especially Three (2016), and The Complex (2003). This includes the opening “Mandelbrot”, as well as favourites such as the Drumbone PVC-piping and the various “Rock Concert Movements” (e.g., ‘Time to Start’), were included, although alas not the most astoundingly brilliant version of I Feel Love with Venus Hum. Special credit is noted for the percussion of Beethoven-Bagatelle no. 25 in A minor (aka Fur Elise). An impressive newer set-piece is ‘iPhone’ involving various successes and failures with giant mobile phones, including a variety of password and application issues, which tied in particularly well with their traditional interest in technological complexity. There is a great deal of audience participation with this show which of course is a classic technique of the mime artist. Fluorescent paint with drums is a big part of the group and their generation of the random artworks from various splash effects are always admired; your reviewer thoroughly appreciates receiving one such canvas and swears this did not affect the judgment at all. Giant bouncing balls abound, giant rolls of paper streamers, and for those who had to wear raincoats in the first several rows, these were necessary for when a delicious mixture of water and old mushed bananas was fired from the stage. A truly impressive game of mouth-catch (and mouth-stuffing) with thrown marshmallows was entertaining, and on a few occasions audience members are highlighted and in one case an individual was dragged backstage, and was subject to being wrapped and painted. All very amusing for the audience who watched this on the screen, positively weird for the individual who did not have such a vantage point. 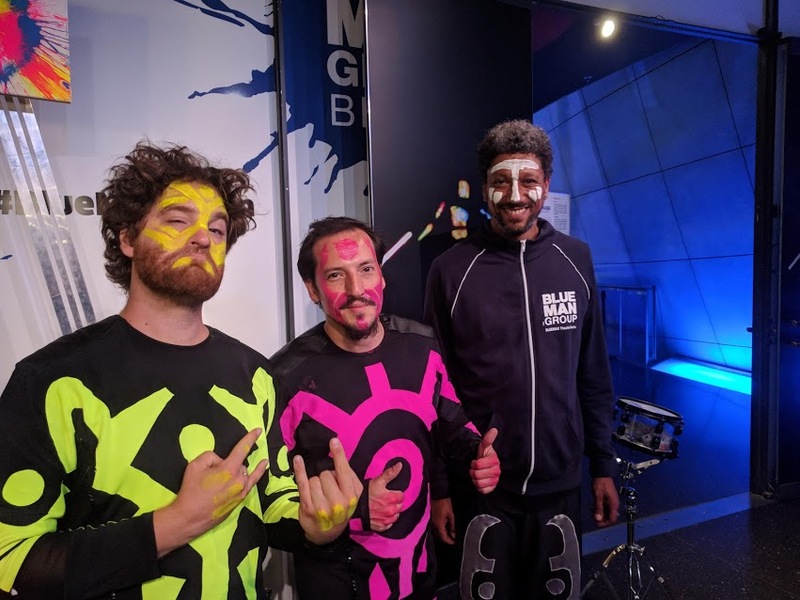 Thematically the Blue Man Group has been able to express a variety of emotions through their mime act and this night was no different. With their slightly alien appearance, they effectively express surprise, innocence, and naivety to technology and cultural expectations throughout their performance with comic-results. Another aspect of their performance is that the discount youth tickets makes for a particularly young show. Indeed, it can be said that they are a rather family-friendly event which in no way detracts from their performance. 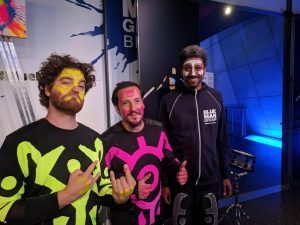 As a worldwide phenomenon with a popular set, Blue Man Group provide an exotic and interesting alternative concert which is enjoyable by all and, curiously, includes some fairly subtle critique of our culture and technology through comic expression.